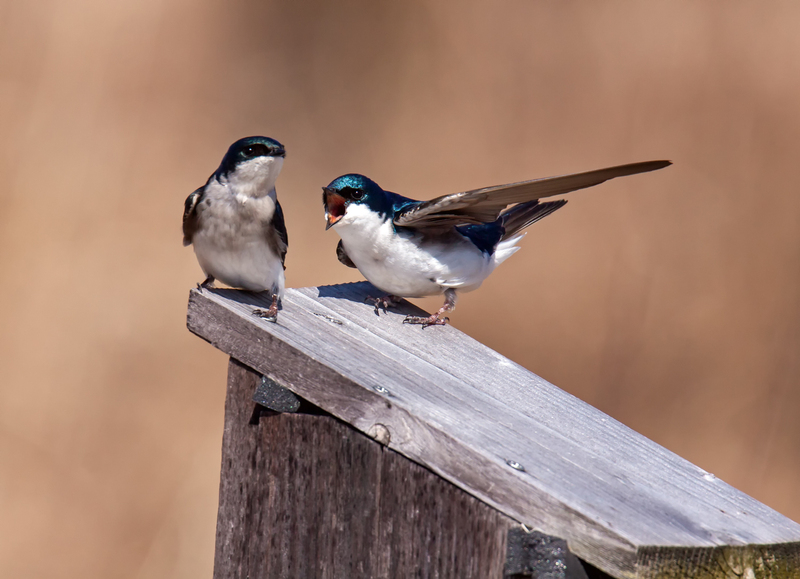 Tree Swallows (Tachycineta bicolor) were back at Occoquan Bay National Wildlife Refuge this past Thursday and they seemed a bit cranky. 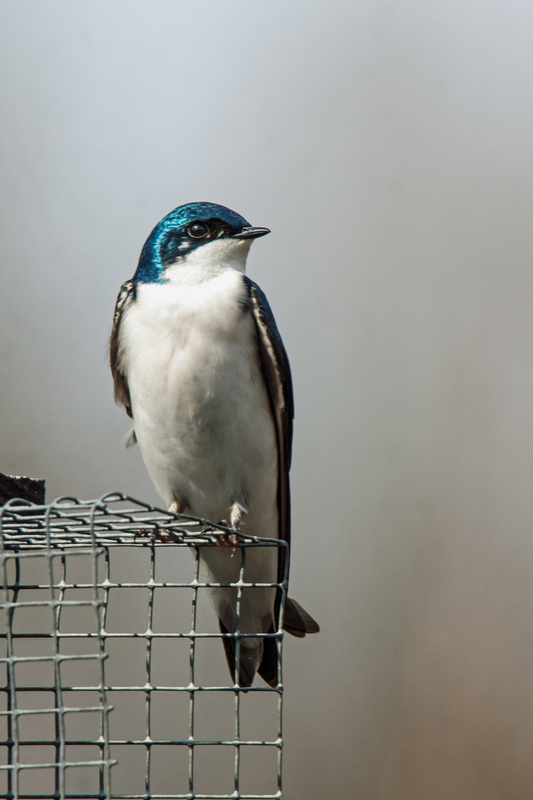 They carried on their heated disputes in the air and on the ground as they checked out nesting boxes. 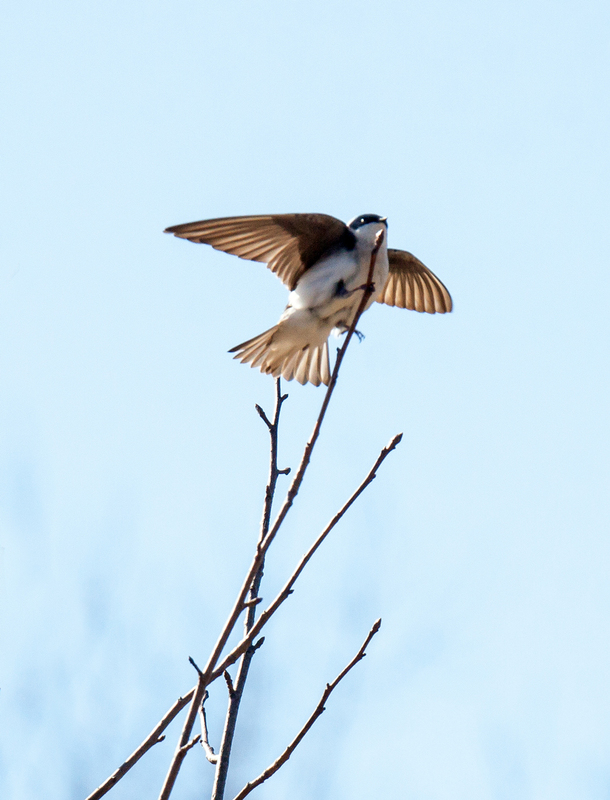 I don’t know if you have ever observed Tree Swallows, but they are small and fast. 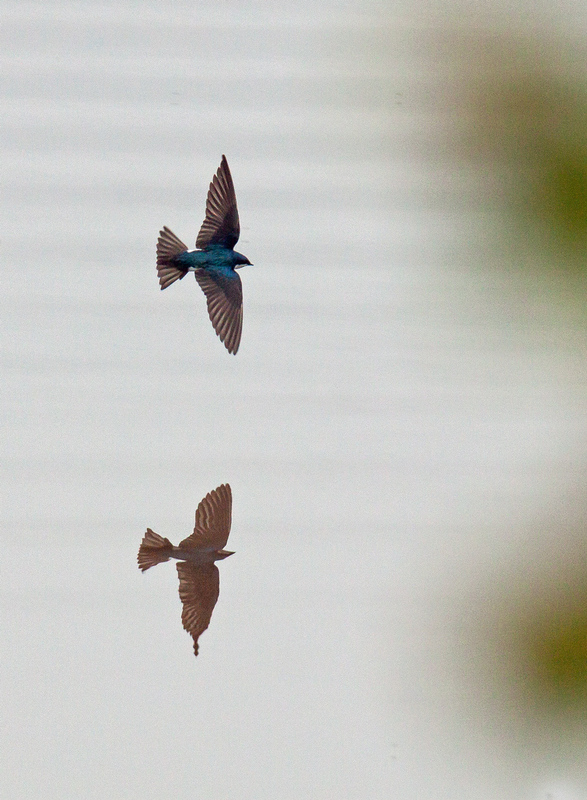 Worst of all from the perspective of a photographer, they fly erratically and turn quickly and often. 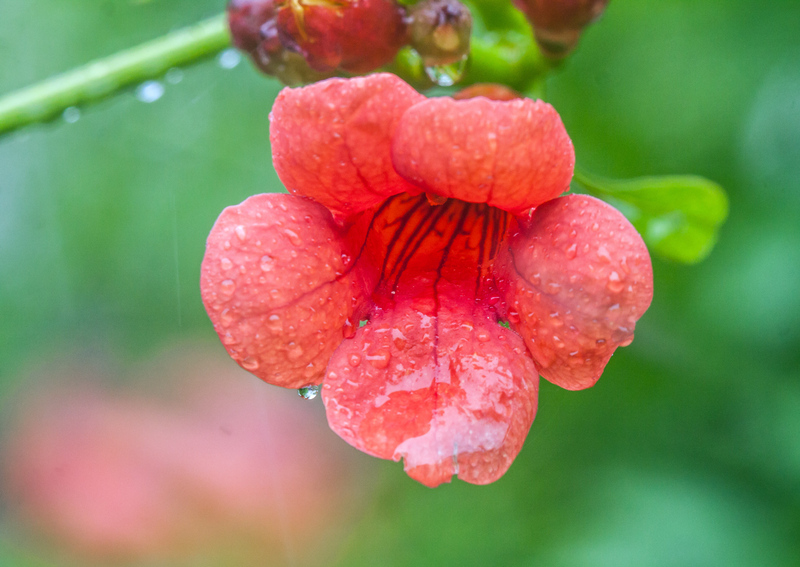 For those reason, I am especially happy with the first image. I should note that it is a cropped image—the original image had a lot more sky showing. 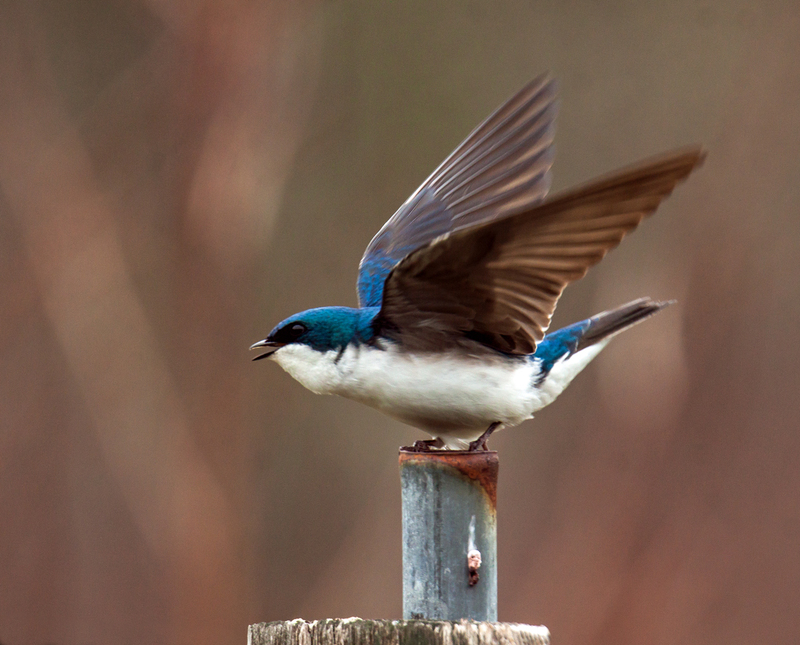 Last weekend at Huntley Meadows Park, a Tree Swallow (Tachycineta bicolor) seemed determined to scare off potential competitors by screaming loudly and vigorously flapping its wings as it sat atop a pole to which a nesting box was attached. 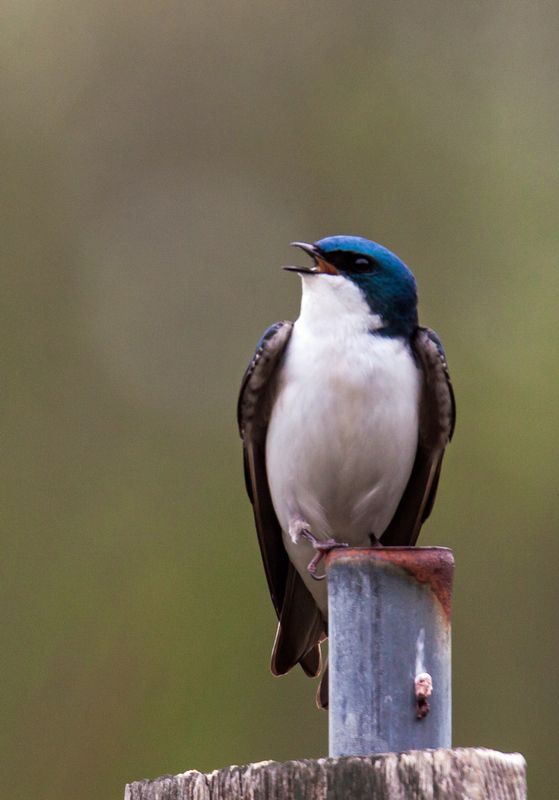 The swallow spent a lot of time looking upwards, scanning the skies for rivals. 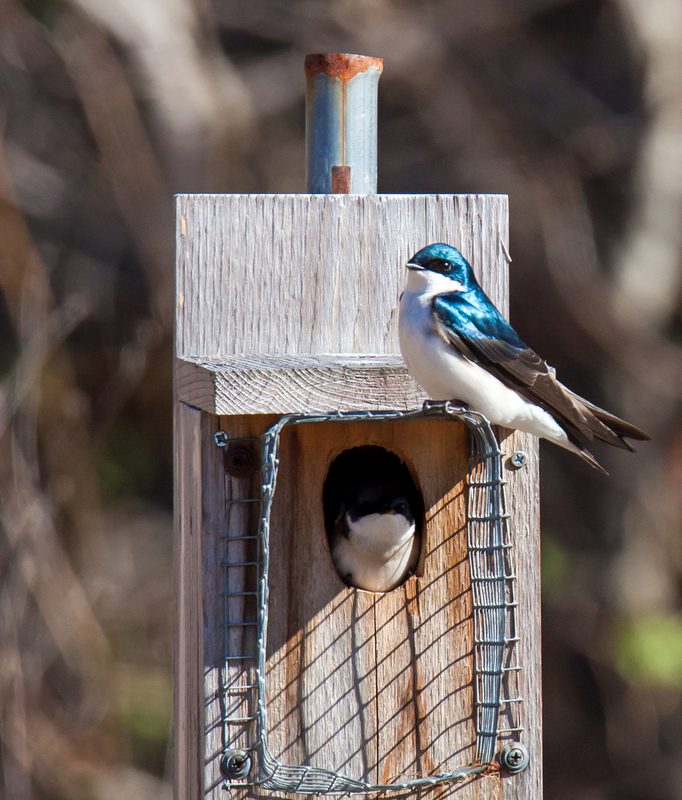 I couldn’t tell if the swallow’s mate was inside of the nesting box or if it was simply staking a claim to the box for future use. 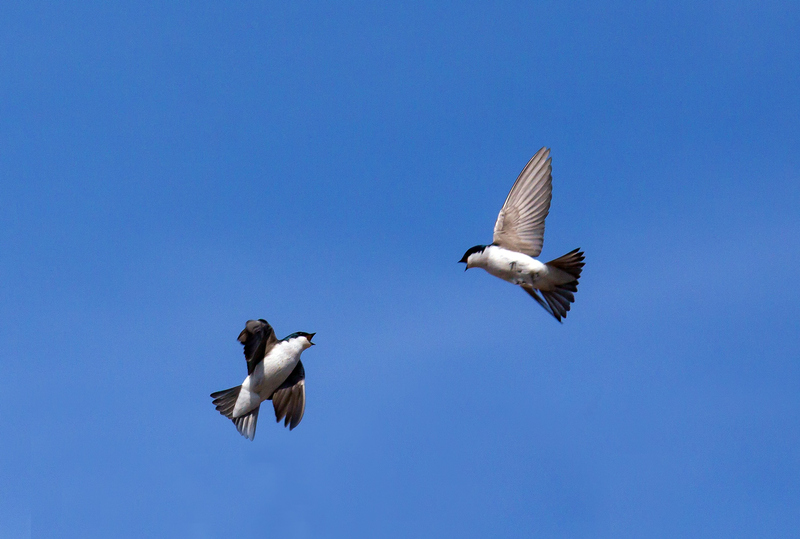 Tree Swallows (Tachycineta bicolor) are fast and erratic fliers as they chase after insects in mid-air. 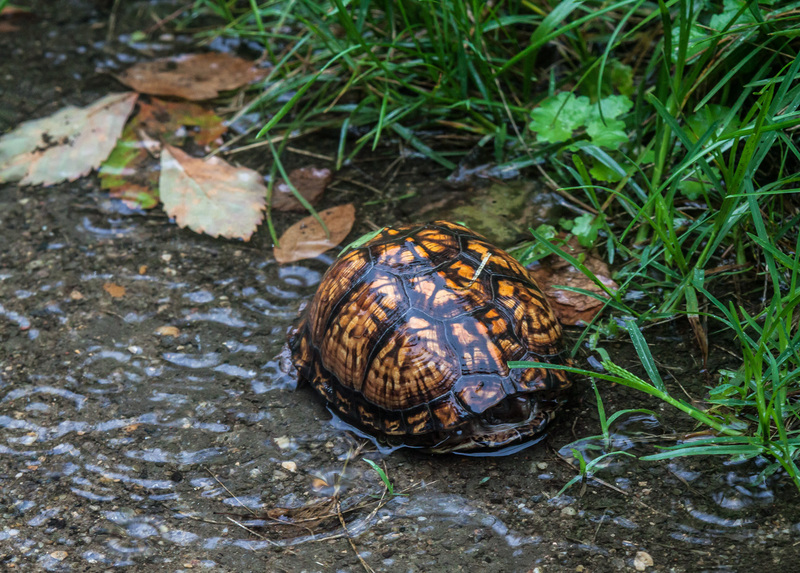 It’s tough to track them in my camera’s viewfinder and even more difficult to get shots that are in focus. 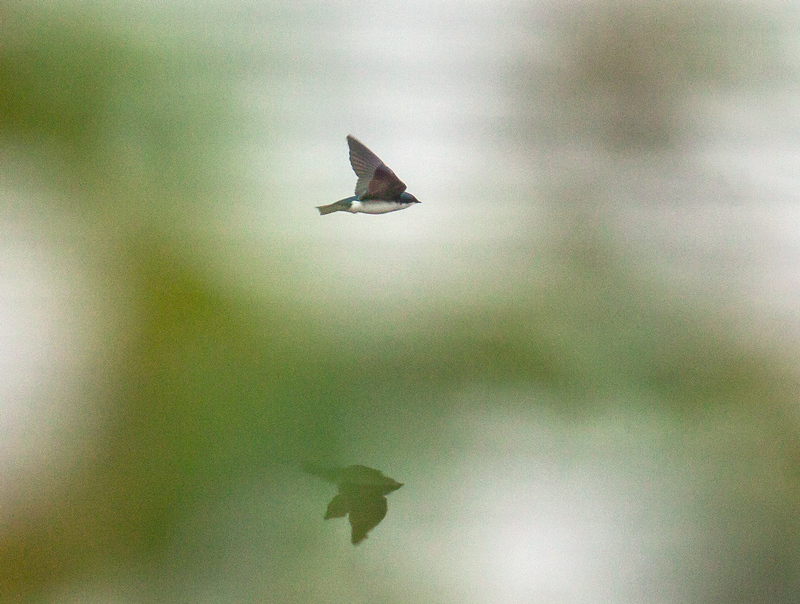 Last Friday, however, I managed to capture some images of a Tree Swallow at Huntley Meadows Park as it swooped so low above the surface of the water that it cast a reflection. It was an overcast day in which the sky and the water seemed to have the same gray color,, making it hard to tell where the sky ended and the water began. 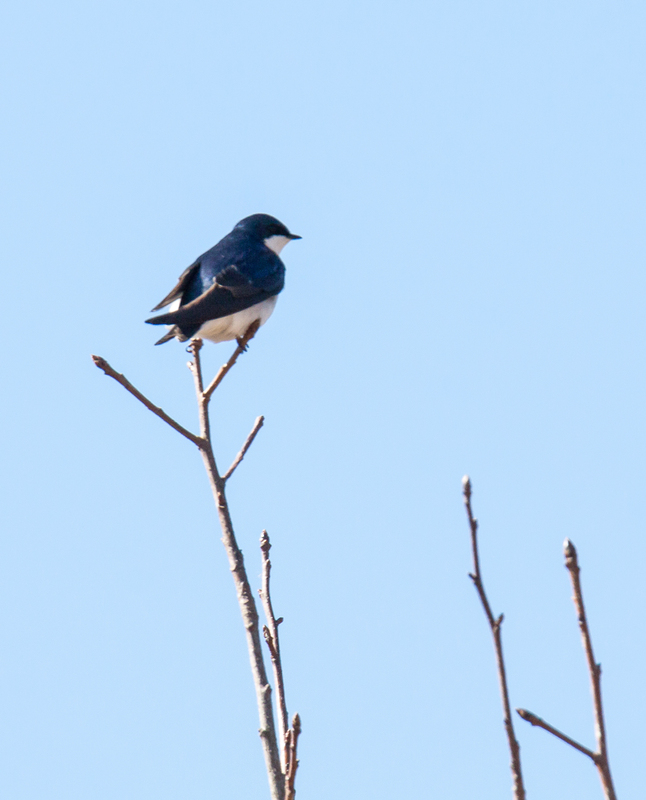 The winds were blowing hard at Huntley Meadows Park on Monday and I watched as a Tree Swallow (Tachycineta bicolor) struggled to stay on its perch high in a tree. 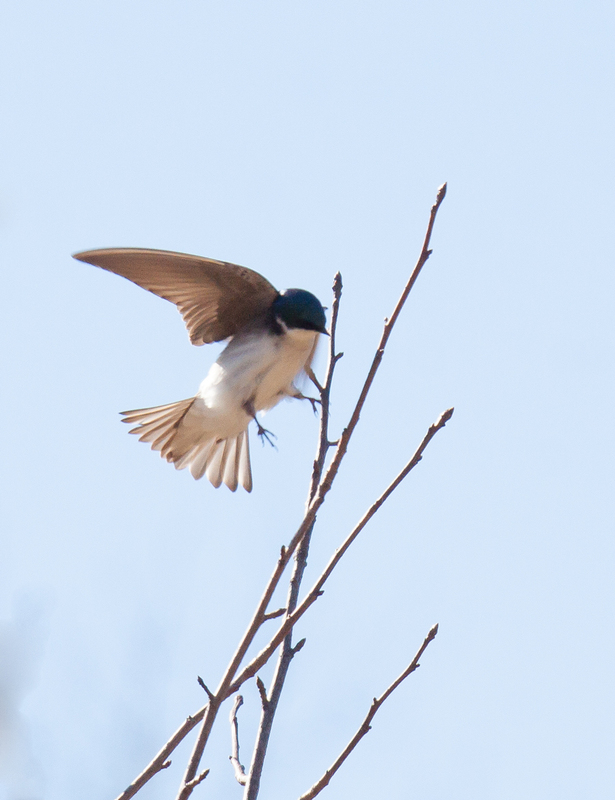 The determined little bird kept changing wing positions in an effort to maintain stability. 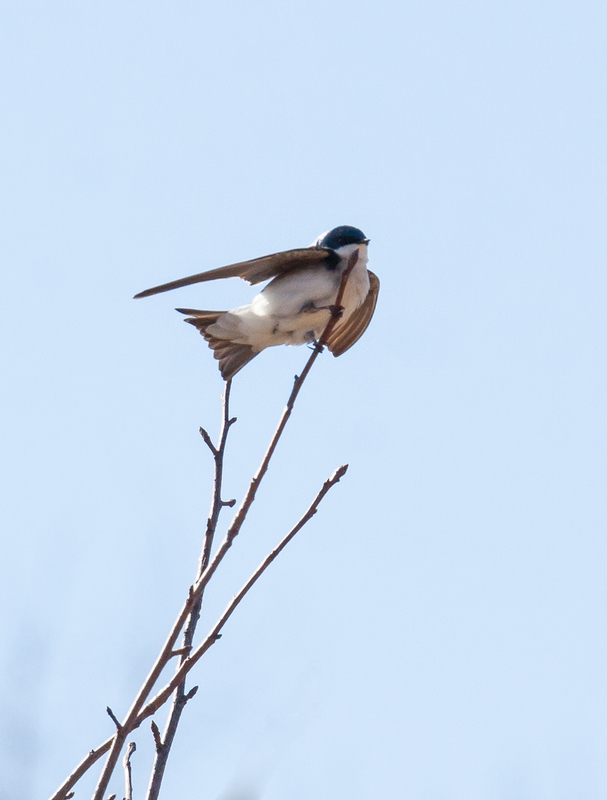 Eventually, however, the swallow lost the battle and appeared to be blown off of its perch. 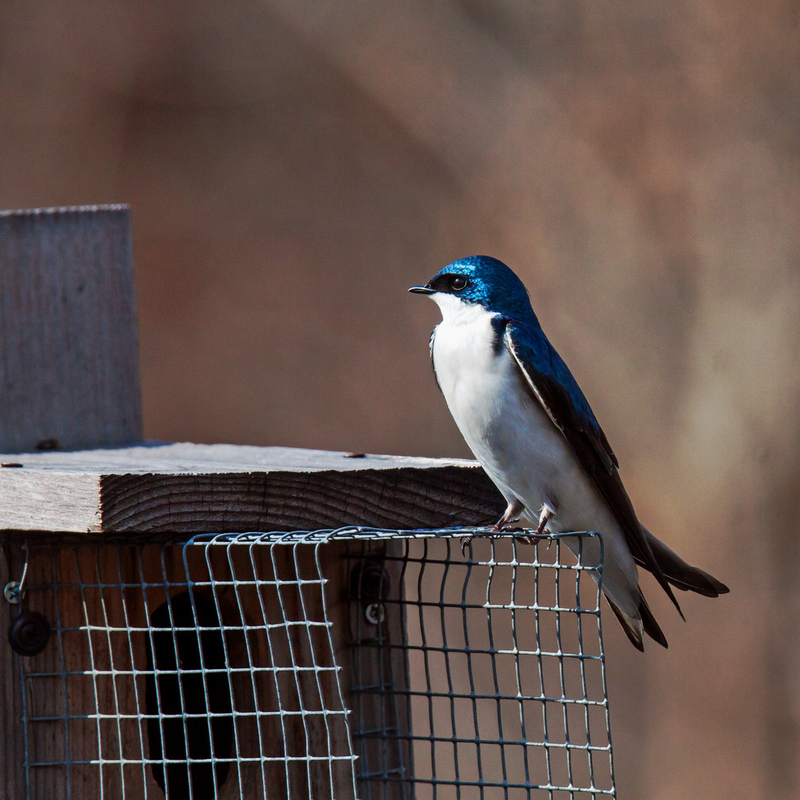 Tree Swallows (Tachycineta bicolor) have moved into at least some of the nesting boxes at Huntley Meadows Park as they get ready for babies. 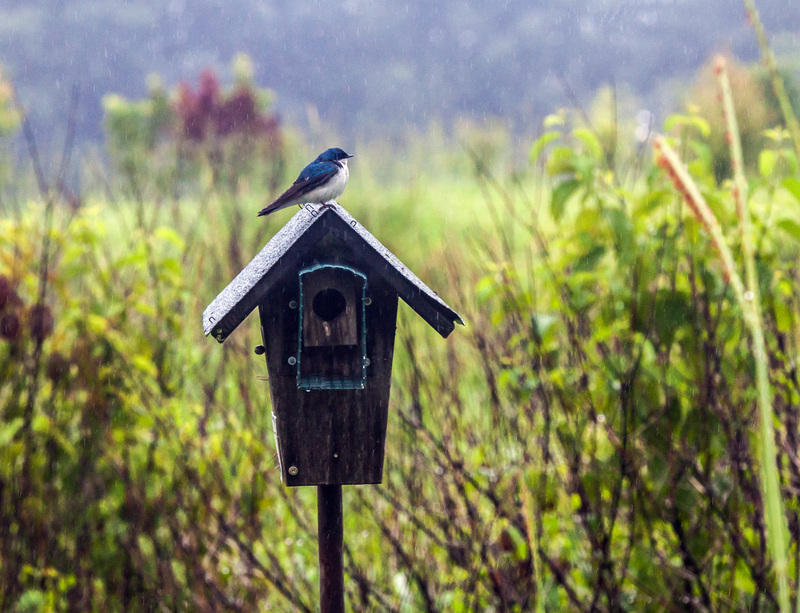 The accommodations are spacious and comfortable, but the views are undoubtedly much better from high atop the trees. 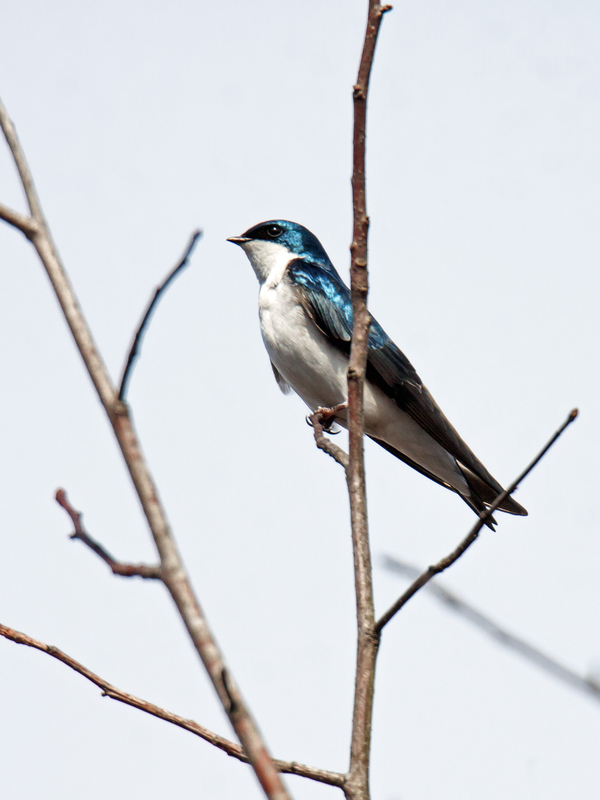 Strange as it sounds, it is unusual for me to get shots of Tree Swallows in a tree. Normally they are zooming about in the air when I see them and it seems rare for them to stop for a rest. 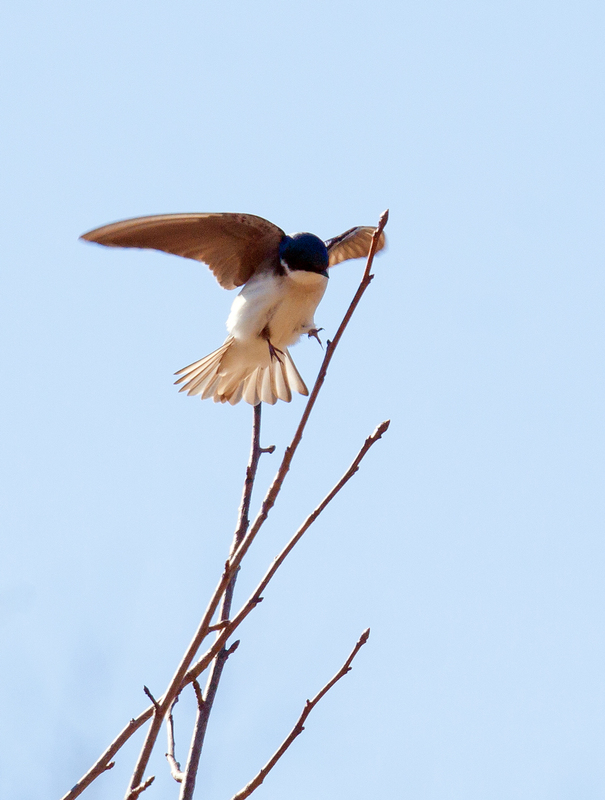 They seem to weigh almost nothing, so they can perch on the flimsiest of branches at the very top of trees. As I learned earlier this week when observing them, however, those perches can become pretty precarious when the wind starts to blow, but that’s a story for another posting.